November 9 2015. Mill is sawing timbers and open for tours Saturdays 1:00 - 4:00 pm for the remainder of November. See the article in the New London Day. October 2015. Mill open for tours Saturdays 1:00 - 4:00 pm. We are awaiting completion of repairs by a contracted firm before the mill can be operated later this fall. June 3 2015. Extended spring 2015 operating season. The mill will be open for sawing demonstrations of local timber Saturday June 6 and Saturday June 13 from 1:00 pm - 4:00 pm. May 2015. The mill volunteers hosted WTNH Channel 8 for a visit to the mill. See the report and video by Kelvin Higgins. Visit the mill spring 2015 on Saturday afternoons 1:00-4:00 in May. December 12 2014. An eventful 2014 for the sawmill! Many dozens of hours of work by the volunteer team on repairs and renovations culminating with sawing again the last two Saturdays in November. November 28 2014. The 140 year old Ledyard sawmill is sawing again! Still a few things to tweak, but the two-year repair project paid off last week as the mill volunteers operated the saw. Mill is open for the final day of the year on Saturday November 29 2014. November 19 2014. Big sawmill news! Mill volunteers will be sawing a log on the historic Ledyard Up-Down Sawmill for the first time this Saturday November 22 following a two year major repair project. November 9 2014. See the History pages on this site for lots of updated information on the history of the mill and the Ledyard Brown family who ran several mills in Ledyard in the 19th century. October 24 2014. The mill volunteer group will have the mill open Saturdays 1:00-4:00 in October and November 2014. We are still working to complete repairs and get the saw up and running soon. Please visit the mill this fall to talk to the volunteers about our repair project. October 13 2014. The mill is open to the public for the fall 2014 season Saturdays 1:00-4:00. Volunteers are still working to complete repairs/renovations - we're hoping we will test the saw in a few weeks. (Pray for rain - the pond is very low!). Tour the mill to talk to the volunteers and see 19th century sawmill technology. September 30 2014. The mill is open to the public for the fall 2014 season starting October 4 on Saturdays 1:00-4:00. Volunteers are still working to complete repairs/renovations, but visitors are welcome to tour the mill and learn about 19th century sawmill technology. September 17 2014. Repair work on the mill is not yet complete, and the mill is not operational as of mid-September 2014. Monitor this web site for updates. August 25 2014. Volunteers from the Ledyard Sawmill gave a tour of the mill and mill repair projects yesterday to Descendants of Capt. Robert Wilcox Brown. Robert was a cousin of Israel W. Brown's father. Israel built the Ledyard Up-Down Sawmill in 1877. July 8 2014. After work sessions every week this spring, the volunteer group is taking a break for the summer months. The repairs and restoration have proved to be a long project, but we are targeting the first Saturday in October 2014 to begin sawmill demonstrations again. See a brief description of the repairs on the About the Ledyard Sawmill page. June 3 2014. Sawmill volunteers Bill Jacobik and Alan Ganong had an enjoyable visit to the Mystic River Historical Society last week. Had a great group attending for Alan's presentation on historical sawmill technology and the Ledyard mill. MRHS were very gracious hosts! Special thanks to Aimee Allaire and Louisa Watrous of MRHS. June 2014. Volunteers completing installation of the repaired Tyler water turbine. Our goal is to have the mill operating for the fall 2014 season beginning in October. May 28 2014. Ledyard Up-down Sawmill volunteer Alan Ganong will give a presentation on the history of the Ledyard sawmill and historical sawmill technology at the May meeting of the Mystic River Historical Society. Wednesday, May 28 at 7:30 at the Mystic Congregational Church, 43 E. Main St. Mystic, CT. Free for MRHS members and suggested donation of $5.00 for non-members is appreciated. May 10 2014. Still working on the mill! Began re-installation of the turbine today. This is a major milestone, but we still need to complete installation of the turbine runner and fabricate and install a new wooden bearing for the turbine shaft to fit onto the new framing that was installed in 2013. April-May 2014. Volunteers working to complete the repairs to the mill and installation of the repairs to the Tyler turbine. Visitors welcome Saturday afternoons in April and May. March 31 2014. A few of the hardier volunteers braved the cold and started back up on repairs to the mill last week. Still work to do on the sawmill itself and the turbine, but we are looking forward to operating the mill later this spring season. Spring 2014. The late winter weather had delayed repairs, but we hope to have the mill in operating condition soon and open for sawing demonstrations this spring on Saturday afternoons. Please see About the Ledyard Sawmill. Fall 2013 Season, Saturdays 1:00 - 4:00 in October and November. The sawmill buildings will be open to visitors, but we will not be operating the sawmill. Spring 2013 Season. The sawmill volunteers discovered at the end of the fall 2012 season several deteriorating timbers in the lower level of the mill. Several of the antique white oak timbers that support the power transmission shafts of the water turbine are rotting. 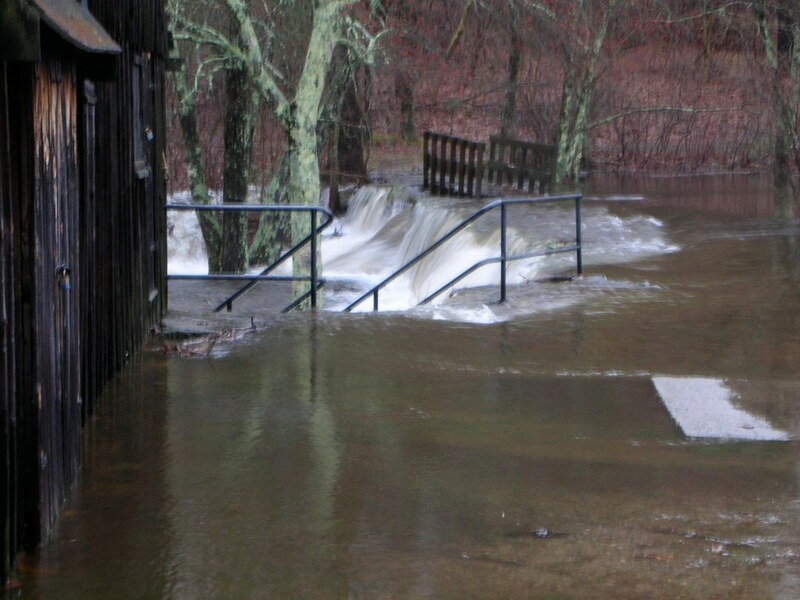 The Ledyard Historic District Commission which administers the Ledyard-owned mill property, buildings, and equipment has made the decision to not operate the mill until repairs are made. The sawmill volunteers fully support this decision and will take this downtime opportunity to undertake some additional repairs and maintenance to the sawmill. Please visit us this spring to view the repairs and maintenance, and watch our dedicated volunteers performing necessary work on Ledyards historically important water-powered sawmill. Extended Spring 2012 Season. We will be sawing some beautiful wide pine this Saturday June 2 & 9, 1:00 - 4:00 p.m. for the Alexander Knight House project in Ipswich MA. November 2011 - Sawing timbers for the Alexander Knight House project in Ipswich, Massachusetts. June 2011 - Ledyard 175th Anniversary Celebration. The sawmill was open for an extended season during the first two weekends in June 2011 to support the celebration of the 175th birthday of the town of Ledyard. Visitors included many town residents who knew of the mill but never had visited before. May 2011 - Cub Scouts Visit. On May 14, 2011, 12 cub scouts and their families from Pack 12, Gales Ferry, visited the mill viewing demonstrations of log sawing and blacksmithing. May 2011 - Woodstock, CT Historical Society. Several members of the the Woodstock Historical society visited the Ledyard Mill as part of their research in a project to save and 19th centruy circular sawmill in the Woodstock area. April 2011 - Visit from New York Genesee Museum Group. On April 26, 2011, five volunteers from Genesee Country Village and Museum in Mumford, NY, south of Rochester visited the sawmill for a special showing of sawing techniques. They have 65 buildings at the museum, and focus primarily on life in the 19th century in the Genesee Valley in western NY. The purpose of the visit was to scope out the feasibility of building an up and down sawmill to add to their village. September 2010 - Ledyard Schools Field Trip. In September, 2010, two busloads of elementary school children with teachers from the Ledyard Schools visited the mill. Steve Tomichek, Bill Jacobik and Warren Dolphin gave interpretive demonstrations of log sawing and answered questions. June 2010 - Early American Industries Association. On June 4, 2010 approximately 150 to 200 people, who were attending the annual meeting of the Early American Industries Association in nearby Mystic, visited the mill. Volunteers Alan Ganong, Bill Jacobik, Steve Tomicek and Warren Dolphin gave interpretive demonstrations of sawing log and answered questions. Other groups interested in old technology and mills have visited the Ledyard Sawmill in the past including the Northeast Chapter of the Society for the Preservation of Old Mills (2002) and Antique Tools and Trades in Connecticut (2001). Flood of March 2010 At the end of March, 2010, SE Connecticut was hit by heavy rains of 8" or more in two days. 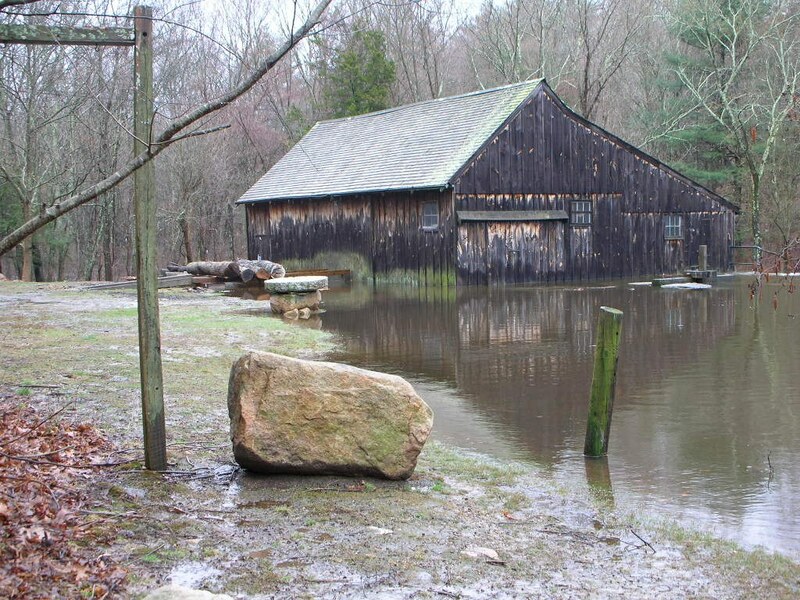 Flooding was widespread, including Lee Brook that feeds the millpond. Below are photos of the mill taken just after the storm by volunteers Ann Cheney and Bill Jacobik. Fortunately, the mill sustained no damage. The first floor level was above the water level passing over the dam. The dry-laid stone basement walls allowed water to pass through with little resistance, so there were no foundation issues. The mill was operating within a week of the flood.